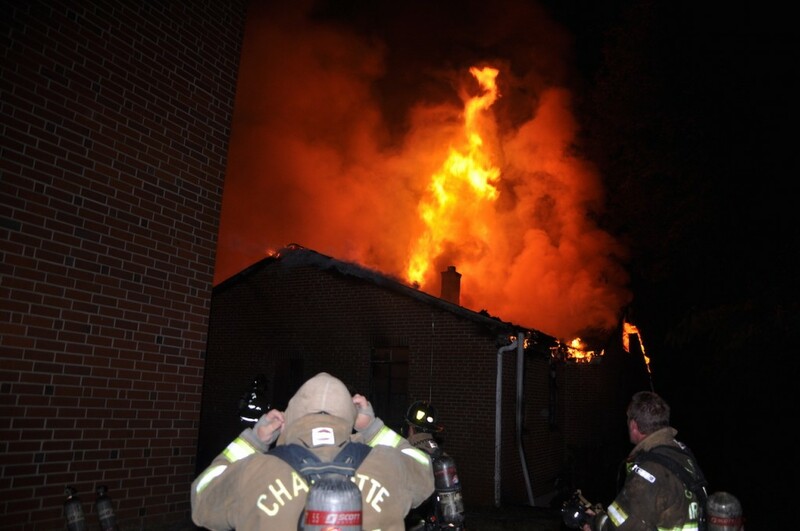 Briar Creek Road Baptist Church burns in Charlotte, N.C., in the predawn hours of June 24. Black churches are burning again. If you want to know what terrorism in America actually looks like you need cast your gaze no further than the charred ruins of the half dozen predominantly African-American churches that went up in flames in the week following the mass killing at Emanuel AME Church in Charleston, S.C. While our popular imagination conjures up images of self-radicalized ISIS wannabes around every street corner, historically American terrorism is more likely to look like the image above than it is black-clad militants marching behind jihadi banners. While an ATF investigation has so far found no evidence that these six fires are either related to each other or even racially motivated, such has not always been the case. In the 1960s and again in the 1990s, waves of arson and bombings targeted black churches across the South. It is the memory of those attacks, and the fact that they come on the heels of Charleston, that has led to the fear that the recent spate of burnings represented a resumption of white supremacist terrorism. These incidents are a reminder that, with a few notable exceptions, and a single extraordinary one on Sept. 11, 2001, the story of terrorism in the United States has long been one of Americans using violence against Americans in support of causes or in the pursuit of goals that are embraced by yet other Americans. From New Left revolution, anti-war, and black liberation struggles of the 1960s and 1970s, to anti-abortion fervor and radical environmentalism in the 1980s and 1990s, and racial hatred throughout, American terrorism typically has been truly all-American. This ought not surprise us. * Public opinion surveys conducted in 1981, in 1995, and in 2000 found that Americans, while unreservedly condemning terrorists as a category, were unwilling to reject the use of violence as a tool of political change. In the 1981 study, 15 percent of those surveyed said there were circumstances when terrorism could be justified. That percentage stood at 17 percent in the 1995 study and rose as high as 26 percent in 2000. What the above signals is that there are likely mitigating qualities that some Americans see in terrorism and terrorist actions that allows them on the one hand to categorically abhor terrorism and terrorists yet simultaneously claim that terrorism may be justifiable. Even after 9/11 public opinion surveys provide evidence that suggests that meaningful percentages of Americans continue to hold sympathetic attitudes toward some terrorist organizations. Here is one astonishing example of Americans’ attitudes about terrorism that is worth thinking about. Six months after Timothy McVeigh bombed the Murrah Federal Building in Oklahoma City, killing 168 and wounding another 800, the public was asked whether they had a positive, neutral, or negative attitude toward McVeigh. A startling 5 percent of respondents said they had a very positive or somewhat positive view of McVeigh, while 12 percent reported that they had neutral feelings about the individual who was responsible for carrying out what was at the time the single deadliest act of terrorism ever on American soil. We need to remember, as we approach the Fourth of July holiday, that the face of American terrorism looks a lot more like Timothy McVeigh and Dylan Roof than Osama bin Laden or Mohamed Atta. *I wrote and presented a paper on this at a conference in 2009 at the University of Missouri. The piece is unpublished, and desperately in need of updating, but you can download and read a copy here. I wrote the other day about the Confederate flag and the renewed controversy over that symbol in the wake of the mass killing by a white supremacist terrorist in Charleston, S.C. I want to revisit the topic briefly to try to make a few points more clear. I accept the argument that the Confederate flag is a hate symbol, but I want to continue to argue that it is more than just that, and like any other symbol, context is key to our understanding of its meaning. So let me present two visual examples to try to make the point. The picture at the top of the post is from the Confederate cemetery in Marietta, GA. In this context, marking the grave of a soldier killed in the war, I struggle to read the flag as a hate symbol. I see it here as a recognition of an individual’s sacrifice in a long, brutal struggle, even if we cannot today know the motivation for which he fought and ultimately died. We cannot know whether he was an eager volunteer or an unwilling conscript. All that we can know is that he was one more victim of a war which has defined the American experience in ways positive and negative. In this context, the flag represents history and memory, not hate. It should continue to fly in such a setting. I see this as akin to and consistent with President Obama’s perfectly reasonable admonition that the Confederate flag belongs in a museum. The second example, below, is by now a familiar one. It is the Confederate flag flying on the lawn of the South Carolina statehouse, and while all the other flags were lowered to half staff to honor those slain at Emmanuel AME church, by state law this one can never be. In this context, the symbolism of the Confederate flag is painfully, obviously clear. It is a statement of defiance against racial equality and forced desegregation, and of longing for a past in which one group of humans could legally own another group of human beings. As this excellent article from the The Atlantic makes absolutely unmistakeable, in this context the Confederate flag is a symbol of proud, unabashed racial hatred, bigotry, and white supremacy. 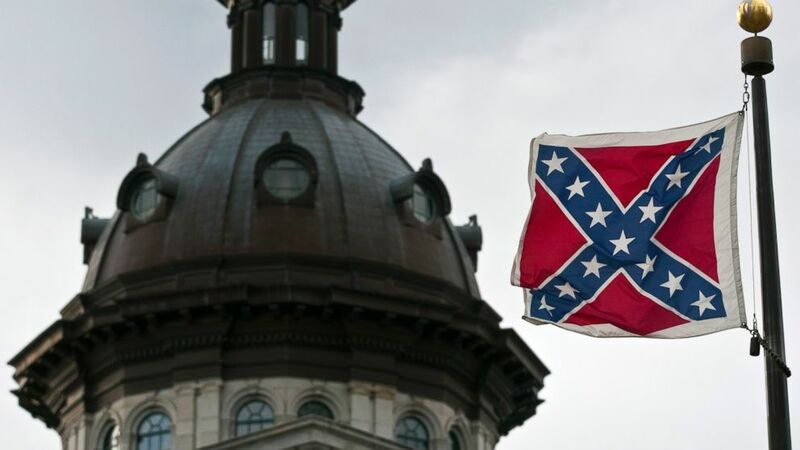 The Confederate flag has no business flying over the offices of any level of government in any state, especially in South Carolina, and especially today. And so I join the voices of those who call for it to come down. But let it remain where it today belongs. In cemeteries, at war memorials, historic battlefields, and yes, museums. It needs to continue to fly in such contexts to remind us of how far we have come as a people, and how far we still have to go. I spent the last four days at a camp in rural northern Alabama learning some of the finer points of singing and leading songs in the Sacred Harp tradition. 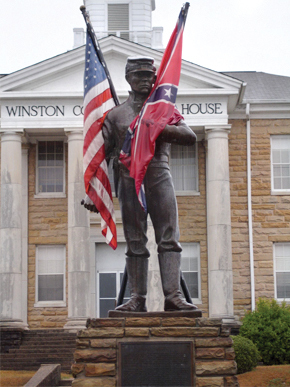 Part of camp included a field trip to the Winston County Courthouse in Double Springs where the above monument stands. I was thinking about this today in the wake of the horrible incident of white supremacist terrorism that occurred in Charleston, SC, on Wednesday night and after reading my friend Steve Saideman’s blog post in which he argued that the battle flag of the Army of Northern Virginia, typically but inaccurately called the Confederate Flag, is a simple hate symbol. I’m not going to argue that Steve is wrong here, only that his characterization is incomplete, an over-simplification of a complex reality in which history, identity, memory, and commemoration are deeply intertwined. Steve is right when he contends that the flag has been embraced by unreconstructed racists and white supremacists, and is seen by the African-American community as a symbol of that racist bigotry. For Steve that settles it: When both the racists and their targets agree on the meaning of a symbol that meaning is set. Often this is where the debate over this particular symbol ends. I’d like to continue it for a moment. Now to be fully transparent, I grew up in a small town in rural central Florida, a place where local lore had it that the Ku Klux Klan provided the color guard for the annual Labor Day Parade up until the 1970s (while I never saw it, I believe the tale). As the child of Yankee parents, I have long thought of myself as “from the South” though not necessarily “of the South,” if that makes any sense. I have no innate love for the Stars and Bars. And while I have never had the desire to fly one myself, I have never made the mistake of assuming that every display of that flag is intended as a statement of unashamed racial hatred or longing for a time in which “those people” knew their place. Let me return then to the monument depicted at the top of the page and what it represents. Winston County* was, in 1860, home to fewer than 3,500 people, mostly poor white farmers. Of that total 122 were slaves. It was also a place where opposition to secession ran strong, where the Confederacy was viewed by many of the residents as intended to cement the political dominance of the state’s wealthy planter class over everyone else. When the Alabama Secession Convention in January 1861 voted by a two-to-one margin to secede from the Union, the county’s representative to the Alabama Secession Convention refused to sign. A vocal pro-Union supporter, he was arrested and spent most of the war in prison. At a meeting held back in Winston County, a resolution was passed declaring that if Alabama could secede from the Union, the county could secede from the state of Alabama. Many of the county’s residents refused induction into the Confederate Army, and when the Union Army invaded northern Alabama in the spring of 1862, many who had refused to fight for the Confederacy enlisted in the Union Army’s 1st Alabama Cavalry Regiment, earning honors at the battles of Monroe’s Crossroads and Bentonville in Mississippi. 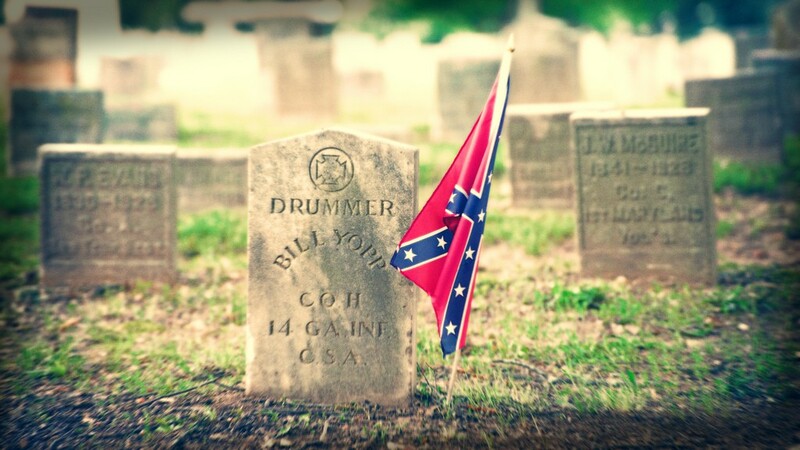 The regiment lost 482 enlisted men and five officers killed in action before it was mustered out of service in 1865. The monument, known as “Dual Destiny,” commemorates this history. Both Union and Confederate flags fly, and the soldier depicted, when you look closely, is seen to be wearing half a uniform from each army. The monument is about politics, that is true. But it is also about sacrifice, for causes both noble and ignoble. And here is where I think we need to think more broadly about the meaning of the Confederate Flag. In my experience, that flag is flown across the South (and I will reserve my comments to that context rather than try to make sense of its use by, for example, Kid Rock and his legions of cutoffs-and-tank top sporting fans) for racist reasons, yes. But it is also often flown at cemeteries and battlefields and historic sites to honor men who are thought to have fought bravely and honorably even if the cause for which they fought and died was profoundly unjust. It is a recognition that good people may go to war for the worst of reasons and to fight to advance immoral policies made by men typically far removed from the realities of the battlefield. We should remind ourselves that such cases are not only found in the distant past. In short this is more than just nostalgia. It should not be reimagined by the rest of us as no more than willful disregard for or ignorance of the complex reality that what the Confederacy was fighting to support was the enslavement of one group of humans by another. The American South, like Northern Ireland, is a place where long memories lie buried too close to the surface. Symbols of heritage, identity, and sacrifice for one community are seen as symbols of oppression, hatred, and violence for another. What’s missing from both places, it seems to me, is the ability of each community to understand and acknowledge the perspective of the other. And until that happens these symbols, whether Confederate Flag, or Union Jack, or Irish Tricolor, will continue to inflame, incite, and divide. *This history of the “Republic of Winston” is taken from the Wikipedia entry of the same name, as is the history of the 1st Alabama Cavalry. I’m not proud of taking this shortcut, but it’s nearly summer and the weather outside is lovely.